Harare — Zimbabwe seems to be a society that is highly allergic to reading and recording its own events. An attempt to capture Oliver Mtukudzi's true life by his former publicist Shepherd Mutamba were rubbished. For his efforts, the author was called a spy and copycat. Unraveled by the criticism, Mutamba penned a second edition. 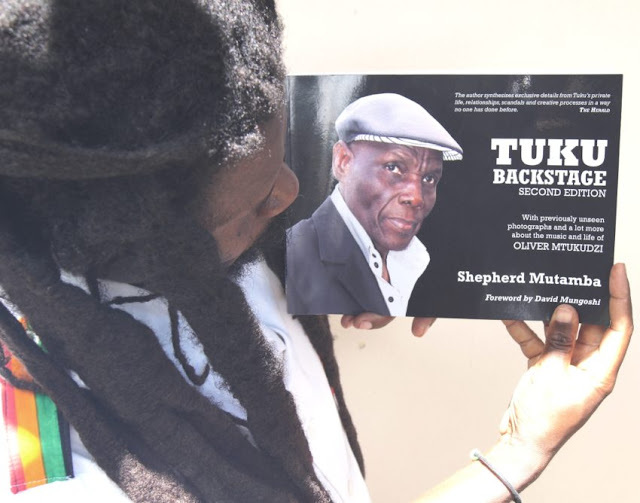 The autobiography, Tuku Backstage did not go down well with his millions of devotees — they saw it as a cheap commercial attempt to gain mileage from a victim. But this is against world trends and norms, for most celebrities have their lives trekked and recorded for future consumption. This can be be done with their blessing or not. Now, Mono Mukundu, Mtukudzi former guitarist has attempted to showcase the late icon's true character in a brief obituary. "Oliver Mtukudzi's guitarist then, Philani Dube, had fallen sick and Tuku was about to go on a two-month tour of Europe and North America so there was a need for a replacement. "A number of guitarists were auditioned but Tuku and his manager Debbie Metcalfe were not impressed, that is when a number of people told them to call Mono," he began his writing in the Herald. Mono had conducted guitar lessons at Prince Edward School, where the late Sam attended school. "I was called by Metcalfe on Monday 3 February, 2003, to come for a practice session with Tuku. "On Tuesday February 4, 2003, I attended the practice session at Debbie’s house. It was a rehearsal and audition combined. I passed the audition that is when I joined the band," he continued. According to the respected guitarist, Tuku was a jovial character, through he could get tough, especially after protracted mistakes. "Tuku was a comic, he would joke with the band members as if he were the same age with them, but at the same time if you misbehaved he would rebuke you in the form of a lecture. "There is what we used to call “The Mask”. Every time you played a wrong note or something that he did not like he would turn around and show you a frowning face, in a way that the audience would never notice but you would clearly notice. "If the mistake was not corrected, that is when the long lecture would come backstage. But I appreciated his need to respect you enough as to not embarrass you in front of the whole crowd. "The way he freely and jokingly interacted with his band members made it easy for the band to have stage work chemistry," remembered Mukundu, who played for Tuku for four years. Chirikure Chirikure, a poet who performed duets with Tuku praised the late jazz crooner. "I will always remember the commitment that you had to your work. Performing for long hours to honour the joy of your fans. Driving from one part of the country to another in the early morning after a show, in order to make it to the next show. "Criss-crossing the world raising the national flag. Spending long hours in the studio helping various fellow musicians with their work. And in all these situations I never heard you saying, “I am tired”."